Protect your smile. Green tea contains bacteria fighting agents that kill the help stop plaque production. Less plaque means you have cleaner, healthier teeth and gums. Another plus, it also kills the bacteria responsible for bad breath. Slow down aging. EGCG is a powerful antioxidant found in many teas, but is present in much larger concentrations in green tea. Antioxidants combat chemicals that are naturally produced in the body that can cause health issues. Studies have shown one substance in green tea can even slow the growth of cancer cells. Promotes a healthier cholesterol level. The EGCG in Green Tea has been shown to lower total cholesterol levels. Specifically, it lowered “bad” cholesterol more than it does “good” cholesterol. EGCG also helps prevent against heart attack and stroke by inhibiting the production of blood clots. 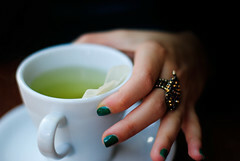 Green tea also helps to lower levels of stress hormones in the body, leaving you more relaxed. Being stressed out can cause damage to the heart along with the rest of your body. Drinking green tea could help keep your heart beating a lot longer. Boost immune system. While green tea can help fight bacteria in your mouth, it can also help fight diseases in the rest of your body. Green tea contains an amino acid that helps fight bacteria and improve the immune response in your body. If you regularly drink green tea, you may find you get sick a less often. Ease rheumatoid arthritis. Green tea is not only beneficial in easing the symptoms of this painful disease; it has also been shown to help prevent you from ever getting it. In China, where more people drink green tea regularly, there is a much lower incidence of rheumatoid arthritis. Lose weight. When you eat a lot of carbohydrates, your body responds by producing extra insulin, leaving you tired and craving more food. Green tea has been shown to help keep blood sugar at lower levels so you don’t produce as much insulin. This can help you eat less and lose weight. Studies have also found that green tea can speed up how fast your body metabolizes certain foods. And the faster your metabolism, the faster you slim down. While these are all great health benefits, you should realize that drinking green tea every so often is probably not going to make a big difference to your weight. Many of the studies that produced results had participants drinking up to 10 glasses of green tea a day! If you find you’re just can’t drink enough green tea for good results, there are supplements available that are green tea based. What if you don’t like the taste of green tea? Try another brand, or a different variety. They can definitely vary in flavor.